What is it, you might ask? It's "Snowpony" – sort of like a snowman, but in this instance, it's constructed in the image of a 1967 Ford Mustang GTA. 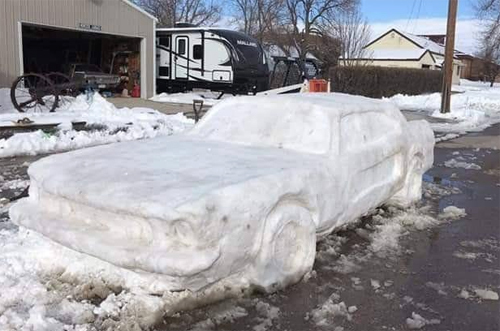 It's the work of 43-year-old Jason Blundell of Chadron and his two teenagers following an early March snow. While we first heard about it in Arizona and found the story at the York News-Times online, it was a video recorded by their neighbor – Sergeant Mick Downing of the Nebraska State Patrol – that went viral. Last we heard, the video had been viewed some 2.3 million times! Watch the Snowpony Video.